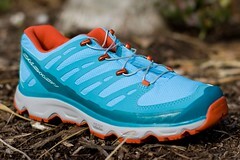 Thru-hikers and fastpackers take notice: the Salomon Synapse hiking shoe is here! After a long winter of anticipation, it’s finally here: the Salomon Synapse hiking shoes are now available at Rock/Creek! If you’re planning a thru hike of the Appalachian Trail in 2012, this is probably the best footwear option available for you, and it’s arrived in time for you to pick up a pair before hitting the trail. Salomon is renowned for cutting-edge, innovative designs, and the Synapse hiking shoe delivers. Tons of traction, incredibly lightweight, quick-drying, plenty of breathability, fantastic cushioning, speed laces… what more could we want? Two things set the Synapse apart, and not just the fact that it looks different than any hiking shoe you’ve ever worn (trust us, that’s a good thing). First, this is a shoe designed specifically for fastpacking and thru-hiking. Previously, most fast-and-light backpackers would just wear trail running shoes, or buy the lightest traditional hiking shoes they could find. Now, with the Salomon Synapse, there is a shoe specifically intended for this activity! They’re ultralight like minimal trail running shoes, but have cushion and support like a hiking shoe. Second, the sole of the Synapse is much more flexible than the stiff, clunky boot soles you’re probably used to. The deep cuts in the tread allow the shoe to flex naturally with your foot, instead of having a single “break” point like a typical hiking shoe. Over long sections of trail, this keeps your feet happy and free of fatigue, and allows you to stride fluidly and efficiently. Last summer, Jennifer Pharr Davis set the world record — not the “women’s world record,” the overall world record — for thru-hiking the Appalachian Trail in 46 days, 11 hours, and 20 minutes. Not only did she wear the Salomon Synapse throughout her trek, she helped develop the shoe with Salomon, and her post-trip tweaks made it into the final design. R/C: How did you end up working with Salomon on the design of the Synapse? That’s quite the commitment, to take delivery of a brand new shoe design and hike over 2,000 miles with it right away! Jen: I started working with Salomon around the same time they had the idea for this shoe. I think it was something of a leap of faith for Salomon Running to commit to making a shoe without knowing for sure who was going to use it… I came in and said “hey, me, I’ll use it!” Honestly, there is nothing else out there quite like the Synapse. It’s definitely my favorite hiking shoe that I’ve ever used. Conceptually, Salomon said they wanted to create a hiking shoe that wasn’t just a scaled-down boot and wasn’t a running shoe, and I thought that was a good start. You need to be able to feel the trail, you know? Your shoe needs to have a bit of “give” to it. Even in lightweight hiking boots, I always feel like I’m just clomping around in these heavy things. I wanted a shoe that was lightweight and comfortable without necessarily being “minimal” …the trail is tough, you still need some cushioning in support. But if we can put it in the lightest-weight package that we can come up with, and make it a hiking-specific product, it’ll be the best option out there. I hiked in a prototype, and provided a little bit of feedback that Salomon was able to incorporate that into their final product. R/C: When you started out with long-distance hiking, did you start out in a boot? Or were you wearing trail running shoes or some other kind of lightweight footwear? It seems like, before the Synapse, all of the options were compromises in some way. Jen: I’d always hiked in trail running shoes just to save weight — every ounce counts, and it’s logical to conclude that weight on your feet matters even more than weight on your shoulders! Certainly, for some people, a hiking boot is a better option, but I never felt that way. Unless you have chronic ankle problems, if you can get the same protection and comfort that you’d have in a boot with a lighter shoe, that makes sense for most people. Basically, there was a need for this type of ultralight hiking shoe, and Salomon recognized it. Most thru-hikers these days wear trail running shoes — they’re lighter than boots or typical hiking shoes, they dry quicker, they’re less prone to cause blisters — but they’re still trail running shoes, built for runners. That means many of them have too much stability in the heel, or too much plating between the foot and the trail, since the shoe is designed for the hard impact of a runner’s foot fall. In fact, a lot of long-distance hikers end up butchering their shoes with pocketknives, or making other modifications! Trail running shoes usually just aren’t conducive to a hiker’s motion. R/C: Speaking of a hiker’s motion, we keep seeing the phrases “Natural Motion Hiking Shoe” and “Run your Hike,” but we’re not entirely sure what those things mean. Can you elaborate? Jen: The shape and construction of the shoe is just optimized for a hiker’s motion. It’s lower profile than most hiking shoes, not nearly as stiff as a boot, with a softer EVA foam in the sole; with the Synapse, the outsole absorbs the trail more. Instead of landing on a stiff sole that causes your ankle to turn and your leg to take that stress, it flexes and your body can naturally react to the shape of the terrain. Your feet are more connected, you know? I feel like there is a lot less stress on the body, because your feet can adapt more to the trail than with a stiffer shoe. As for the “run your hike” concept, a lot of fastpackers hike the uphill sections of a trail and jog or run the downhills. It’s a lot more efficient to hike that way, you cover more ground on the downhills without much more exertion, but you really need to have a shoe that allows you to do this. It’s part of what makes the Salomon Synapse so ideal for thru-hikers and ultralight backpackers or fastpackers. Honestly, I also think it’s great for any kind of ultra marathon where you might find yourself hiking some steep sections of the course; I ran the 2011 Sweetwater H20 50k in the Synapse, and finished 2nd female! Jennifer will be visiting Rock/Creek in March! On Friday night, March 9, she’ll be giving a presentation at our 2 North Shore store on breaking the AT record. There is no cost for this event. Saturday morning, she’ll be giving a mini-clinic that covers gear, training, budgeting, planning, and emotional prep specific to hiking the Appalachian Trail (whether it’s thru-hiking or section hiking); afterward, we’ll go for a hike at the Lula Lake Land Trust. Tickets to this special public clinic are $20, stay tuned for details! The Salomon Synapse is designed specifically for piling up fast, smooth miles on some of the best trails in the world. With this shoe, there’s nothing to slow you down… take some photos of your epic trip for us, and come visit our Facebook page to show us what the Synapse allowed you to do! Several years ago I thru-hiked the CDT with 2 partners. In preparation for the hike we purchased 6 pairs of Montrails each. This was a conservative estimate and Montrail gave us a good deal. We estimated we would get 500 or so miles per pair. It was a bit overkill in retrospect but we didn’t want to have to buy shoes on the trail. The shoes worked well in the varied terrain we encountered and we only used half the shoes we purchased on the hike. I remember many discussions on the trail with other thru hikers about brand and design that would best fit our needs. To my knowledge no shoe company has developed a shoe specifically designed for thru-hiking except Solomon (with the help of Jennifer Davis). It is really refreshing and exciting to know there is a shoe designed specifically for the thru-hiker needs and I plan to try a pair during my longer hikes as I prepare for my PCT thru hike next year. The reason I am writing this review is to endorse Solomon’s warranty policy. I purchased a pair of XA Comp 6 shoes late Dec. 2011. I use them for approach shoes for rock climbing trips on the weekends, over nighters and at a high ropes challenge course where I work. I noticed that there are a couple of holes beginning to form above the location of the big toe on one shoe and the little toe on the other shoe. This disappointed me because the shoes have provided excellent support, traction and comfort for practically everything that I do. At first I thought I’ve just blown through another pair of shoes and need to spend another $100 or so for a new pair. I called Solomon and discovered that their shoes typically have a two year warranty. I was connected to a human being immediately and she explained that I just need to return the shoes and they will “take care of me.” She also said IF I have any problems at all to call her back and they will send me a new pair! The shoes are an excellent match for me and what I do these days. The fact that Salomon backs up their shoes with this incredible warranty and offered to help me personally sold me. I rarely post reviews, but I was so impressed with the promise to stand by their warranty that I felt it was important to share with others who may benefit from this knowledge. That’s great insight! For us, the best part about this shoe coming from a company like Salomon is that you KNOW the build quality and warranty we’ve come to expect from Salomon are behind it. When new ideas come from unproven sources, it can be a bit daunting to take the plunge; when they come from a manufacturer we already know and trust, it’s a different matter. I also agree that it’s really refreshing when Salomon sits down and says “OK, we want to build a shoe specifically for thru hikers and ultralight backpackers” — many other companies would be gun-shy about trying something so new and uncharted, or panic too much about whether customers will respond to such an unfamiliar idea. Glad you enjoy the Salomons you have now, and here’s to hoping the Synapse works well for you on future hikes!